Dennis James hasn’t had a Halloween off in forty-three years. Given his mastery of the art of the cinema organ and the rich store of silent films appropriate to the ghoulish occasion, he’s unlikely to get a reprieve any year soon. Even Super Storm Sandy couldn’t end his streak. His travel cased stocked with a sprawling musical score and a red-lined vampire cape, James flew through turbulent skies and against steep odds to make it to Cornell University’s Sage Chapel in Ithaca, New York by [last] Wednesday in time to accompany F. W. Murnau‘s Faust of 1926. From another cardinal direction came his musical partner for the evening: Mark Goldstein, virtuoso of the Buchla Lightning Wands. These implements take their name from the avant-garde inventor of electronic instruments, Don Buchla of Berkeley. They are about the size of sticks of dynamite and, when asked to do so, can pack a kindred sonic punch. While the organ conjures an entire symphony from pipes of a bewildering variety of shapes and sizes, the Buchla wands in Goldstein’s magic hands produce the thunder of timpani, the chanting of monks, the howling of wind – among countless other sonorities and effects. Like the spooky Theremin, which James hopped up from the organ bench to play at some of the more uncanny moments of a film bursting with uncanniness, these infrared-emitting wands convert gesture to music: the speed and direction of the hands moving through a magnetic field shape sound in the air. 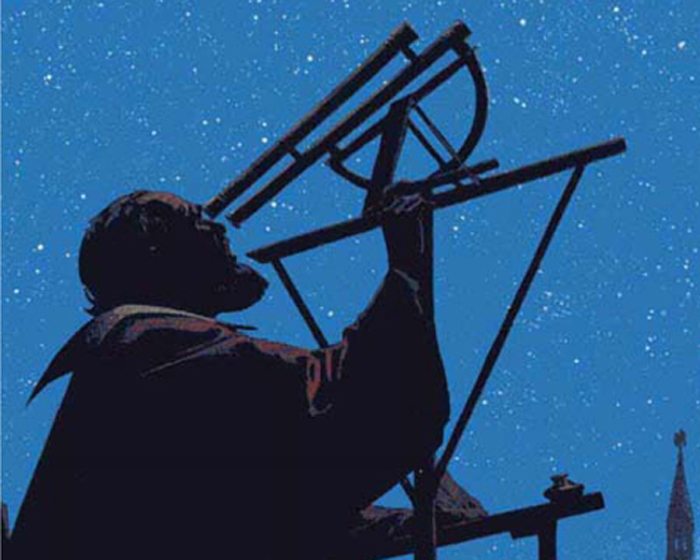 The ancient alchemist Faust would have liked the music that results from this instrument not just because of the universe of sounds it can make, but because of the truth it reveals: that the invisible is as real as the visible. Together, Goldstein and James call themselves the Filmharmonia Duo, and have toured the world – and elsewhere, judging by their penchant for the ethereal. Born in 1950, James has been at the forefront of the revival of silent film organ accompaniment for more than four decades. 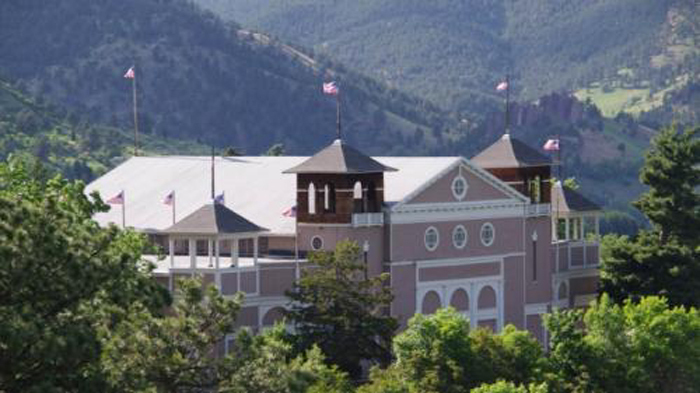 He has held appointments as house-organist at many historic theatres across the United States and continues to be much in demand internationally. I first heard him play Buster Keaton‘s The General – which came out the same year as Murnau’s Faust – on the Wurlitzer organ at the Stanford Theatre in Palo Alto. James’ tremendous talent for matching musical figure and mood to on-screen action and emotion transformed the movie. One sees Keaton’s comedy in a new light when James plays it: not only was the comedy sharper and funnier, but cinematic time seemed to rush ahead, urged on by his exuberant music. In a very different vein, James score to Lillian Gish‘s La Bohème (yet another film of 1926 – the silent cinema burning brightly in its last years) is a masterful exploration of the myriad tonalities of desire and affliction. When the aged Gish heard James’ music to her film, she told him, tears streaming down her face, that his was the score she’d always wanted for the work she considered her finest. Gish and James then toured for six years with the movie and his score before her death in 1993 at the age of ninety-nine. James has dedicated his career in part to debunking the notion that the great cinema organists of the past simply made things up as they watched the film. Improvisation plays an important role in his art: patching in the transitions; chewing the scenery; or, in the most extreme cases, coming up with an entire score on the spot when the film itself doesn’t show up and another has to be found at the last minute. But these skills do not substitute for the careful creation a score. James is an avid researcher into the history of film music, and he has scoured studio archives for cue sheets and other evidence, which, when put into play, produce exacting and exhilarating music that is more than simply accompaniment, but instead, an inextricable companion to the images. Every time he does a silent movie, James proves again that there is a world of difference between the lax noodling, however gracious, of many a would-be silent film musician, and his own consummate professionalism and artistry. This is not to say his playing is at all pedantic. James’ ebullient personality expresses itself in a vigorously animated performing style, filled with perfectly placed musical exclamations points, bravura runs, quaking fortissimos, and exquisite pathos. His scores are fully formed artistic entities with room in the corners for the spontaneity that movies screened before a live audience demand. 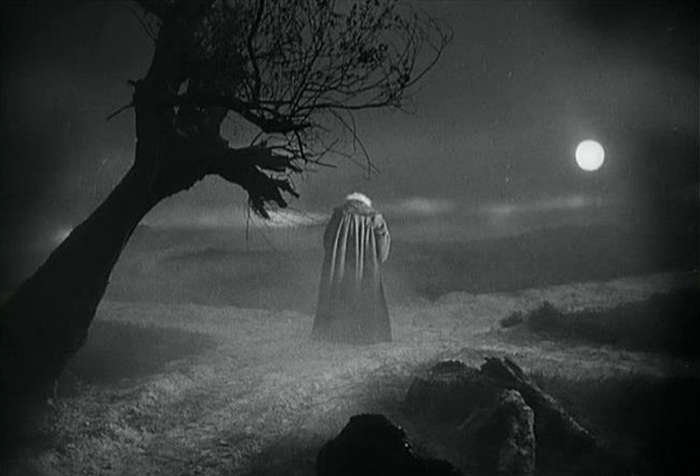 Faust was Murnau’s last German film. By the time it was premiered in Berlin in 1926, the director was already in Hollywood working on Sunrise, the film most critics claim as his masterpiece. Faust was high budget and high concept, filled with novel cataclysmic effects: magic fire; super storms; self-writing books; and characters evaporating into thin air. There are tumultuous battles between good and evil, and flights across the sky and across time. Murnau’s cast was packed with the greatest European stars of the day – most famously Emil Jannings as Mephisto. One of Toulouse Lautrec‘s favorite subjects, the Moulin Rouge star, Yvette Guilbert appears as the bawdy aunt, who becomes besotted with Mephisto in an extended comic interlude towards the end of the film. Guilbert was more than a few years past her prime of the 1890s Parisian nights, but she and Jannings light things up with their own mutually augmenting electricity. The Expressionist sets – of steep-roofed cityscapes, Italian palaces, haunted moors, and Faust’s lugubrious study – are marvels of both precision and distortion, a nightmare version of Dürer. 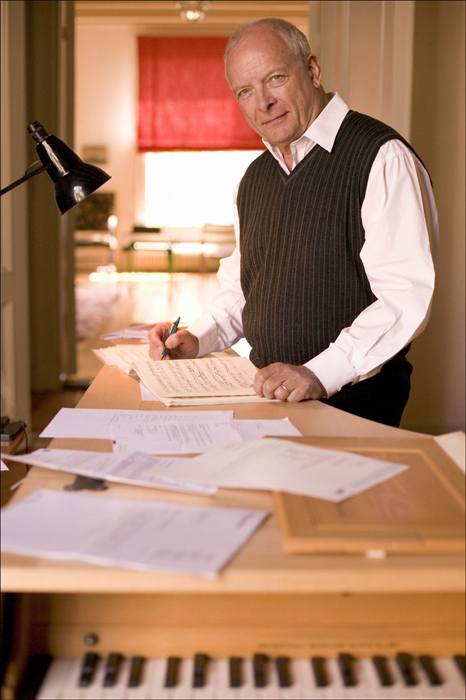 For his score James has compiled a range organ classics and operatic transcriptions. The first half of the film relies on austere Baroque works to evoke Faust’s medieval world of plague, superstition, and fear. The furious aural assault of Buchla thunderbolts from Goldstein’s wands and the organ’s mighty chords ushered in the opening credits: the German inter-titles printed in pseudo-Gothic letters (with digital German subtitles), and the background antiqued with striations, as if Dürer had been sharpening his stylus on the celluloid. Bach’s Passacaglia in C minor (BWV 582) took on ominous dimensions as it trudged through the dying city, the plague devastating the populace as the result of the wager between the angel and devil in the movie’s prologue. Various fugal disquisitions eventually dragged us to the moral crossroads where Faust meets Mephisto and the two seal their nefarious pact in blood. James’ exhumes these organ classics with opportunistic flair, seguing impishly from Bach to Buxtehude and beyond. 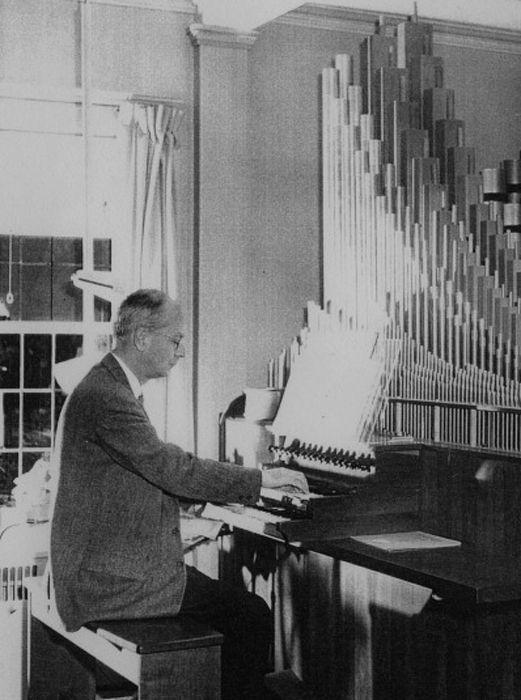 At the Cornell instrument James discovered previously unknown sonorities, from the ponderous to the plaintive. With the film’s candlelight glowing off rounded monkish faces, Goldstein’s wands sang the Passacaglia theme in lugubrious tones. Modern electronics made clear the initially altruistic motivations for the Faustian bargain. The no-holds barred libertinage that soon following, with Mephisto transporting Faust to Italy to feast on the ample bosom of the Duchess of Parma, inspired a rampant bacchanal from the organ, full of runs as electrifying as the high voltage commentary from Goldstein’s hands. The second half of the film, in which Faust pursues Gretchen, spurred James to a fantastically clever reworking and reimagining of themes from Gounod’s Damnation of Faust. Goldstein pitched in here, too, but was still busier with sound effects like Gretchen’s opening and closing of the jewelry box hiding the enchanted necklace given her by Faust. James milked every ounce of sympathy from the heart-rending prayer of Gretchen for her baby, shivering along with her in the snow. This was the calm before the final storm, when Faust is wrenched back from false youth and into old age. He then storms through the crowd watching Gretchen about to be burned at the stake for killing her baby. Unsurpassed in his ability to pull a happy ending from even the most despairing of tragedies, Murnau concludes with a celestial battle between good and evil in which Faust and Gretchen are reunited in heaven. Mephisto therefore loses his opening wager. The updrafts from the pyre fueled the inexorably crescendo towards love’s ultimate triumph, sealed by a giant white-winged angel. The mighty blasts of organ and Buchla wands gave way to roaring Halloween applause from a packed church in rapturous appreciation of James and Goldstein’s unholy alliance. This Faust is in good hands, hugely skilled, but – just as important – brilliantly irreverent. Shigeyoshi Osaki at Nara Medical University in Japan has studied the properties of spider silk for thirty-five years. In the past decade he has focused on trying to turn the silk into violin strings, even taking lessons on what was required of a string in terms of strength and elasticity. 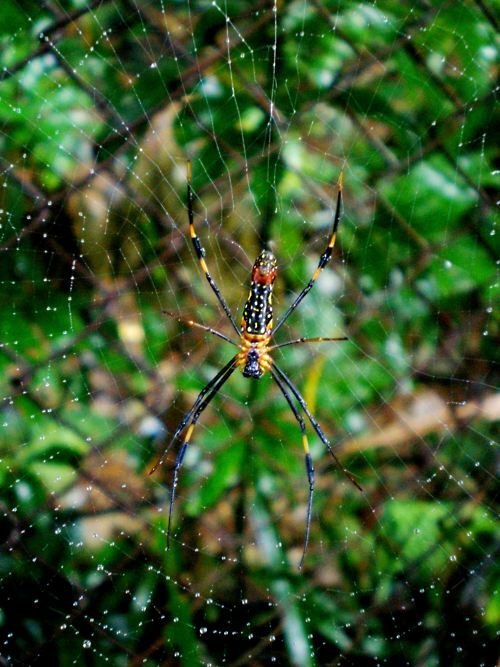 Osaki learned how to coax Nephila maculata spiders to spin out long strands of dragline, the strongest form of silk. He bundled filaments together and twisted them, then twisted three of these bundles together to make each string. The thickest of these, the G string, holds 15,000 filaments. The strings turned out to be tightly packed and strong. The key seems to be that the individual filaments changed shape when twisted: an electron microscope revealed that their circular cross sections turned into polygons, which nestle together more tightly than cylindrical strings. This came as a surprise. “To my knowledge, no one has observed such a change of cross section. I doubted my experimental results,” says Osaki. The spider silk must be deformed by the twisting process. “The material is a bit squishy, like twisting plasticine,” says physicist and violinist Katherine Selby at Cornell University in Ithaca, New York. Osaki tested the new strings by comparing their performance with three established materials: steel, nylon and gut. He says that the spider silk has a unique and “brilliant” timbre, or quality of tone. You can judge for yourself in this snippet of Tchaikovsky, played by Jun-ichi Matsuda on a Stradivarius violin using all four types of string. The timbre seems to result from a difference in how harmonics – frequency multiples of the main note – reverberate in the spider silk strings compared with other materials. Spider string has strong high harmonics, while steel and nylon tend to be stronger in low harmonics. Osaki does not yet know what mechanical properties lead to this acoustic performance. “It is impressive when you remember these are prototype strings, just out of a material science lab, being compared with commercial strings perfected for years,” she adds. Selby points out that the high strength of spider silk may give it another advantage: “You could have a thinner string for playing the same pitch, which would be a bit more bendy and responsive – it would hit a note quicker.” The material could be especially suitable for thin E strings, which are very fragile when made from gut. “Is it something all violinists will like? That’s an open question. It will have some surface texture, like a rope. Some people may find that off-putting as they slide a hand up and down the neck. I think these will be gourmet strings,” Selby adds. The price will be too steep for most fiddlers in any case, but Osaki is now trying to find a way to produce the strings in larger numbers.